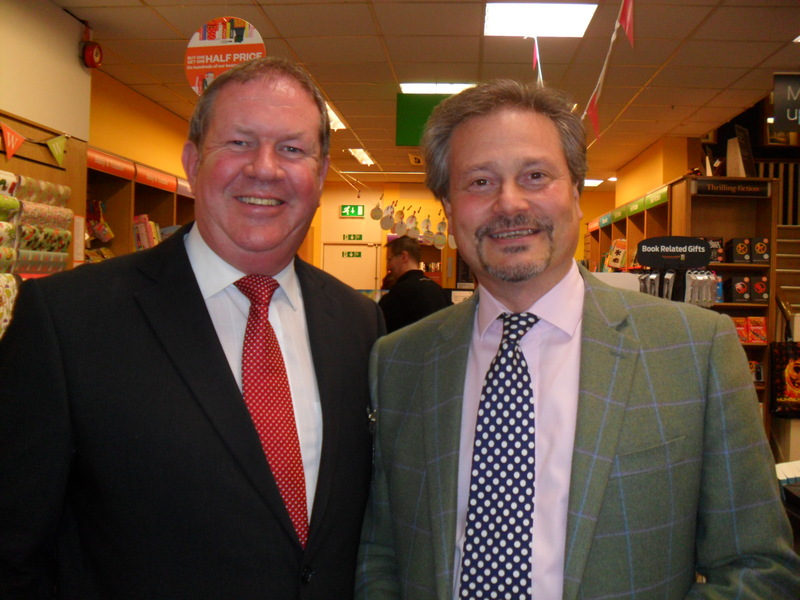 Before I give you all the exciting news Bob and I would like to thank everyone we have met along our ‘journey’ for their hospitality and friendship – please keep in touch! Thank you to the other authors in the Caffeine Night Publishing stable for their support – you are amazing guys. 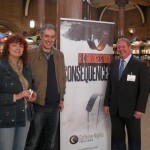 Please check them out – http://www.caffeine-nights.com/ And last but not least the biggest thank you to Darren E Laws our publisher who is simply ‘the best’ – we couldn’t have done it without you. 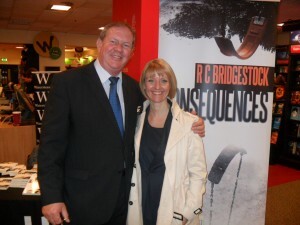 We are on facebook, Twitter and Linkedin – you can connect with us here through our website www.rcbridgestock.com. 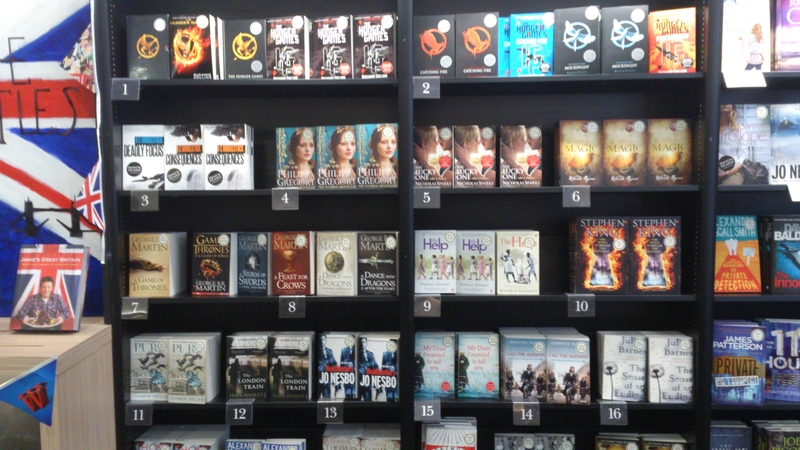 ‘Consequences’ achieved the No.1 place in the Bestsellers Chart at Waterstones in Newport, IOW on the same week Hunger Games came out. 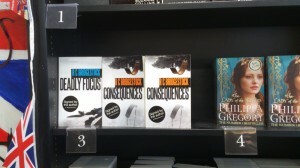 Both titles achieved the No.3 place in the Bestsellers Charts in Huddersfield. Just look who is around us? Now, the news you’ve all been waiting for. 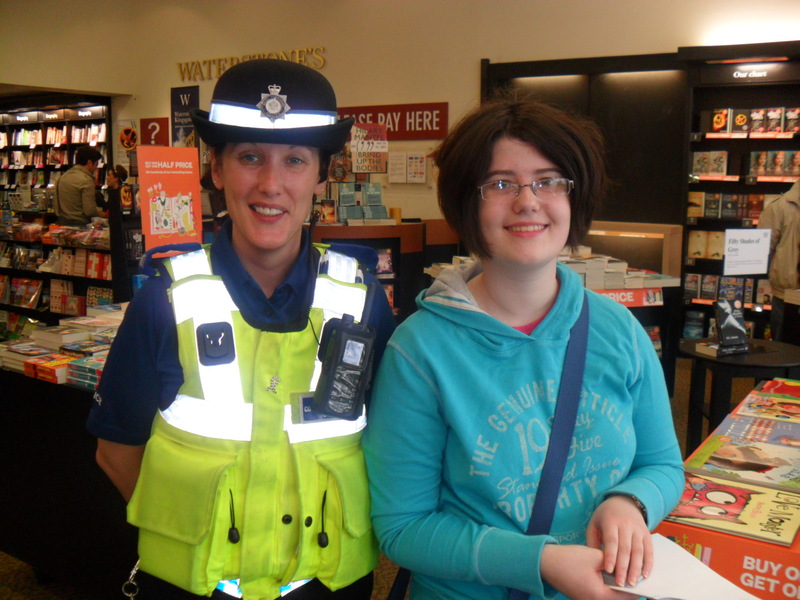 As you are aware before the tour we asked people if they’d like to put their name in the policeman’s hat to be character-named in a book, in the ‘Dylan’ crime series. By the end of the tour we had one very full helmet! 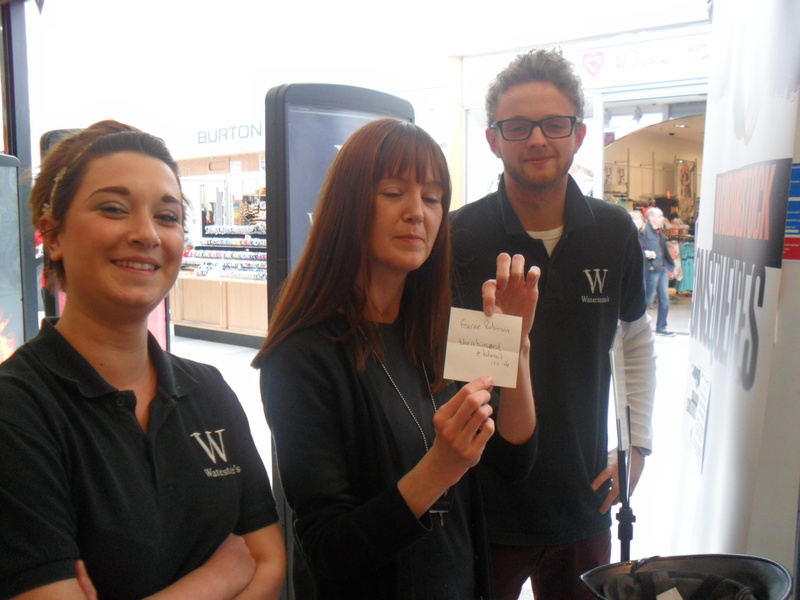 During our time spent in Huddersfield as you can see from our blog posts we had a special draw for that day only as Huddersfield is our hometown. Fearne Robinson was the name picked out that day by the Manager of the Huddersfield store – you can see the pictures on our blog for Saturday 21st April. Since we had so many entries at the end of the tour we decided to pick out two names. 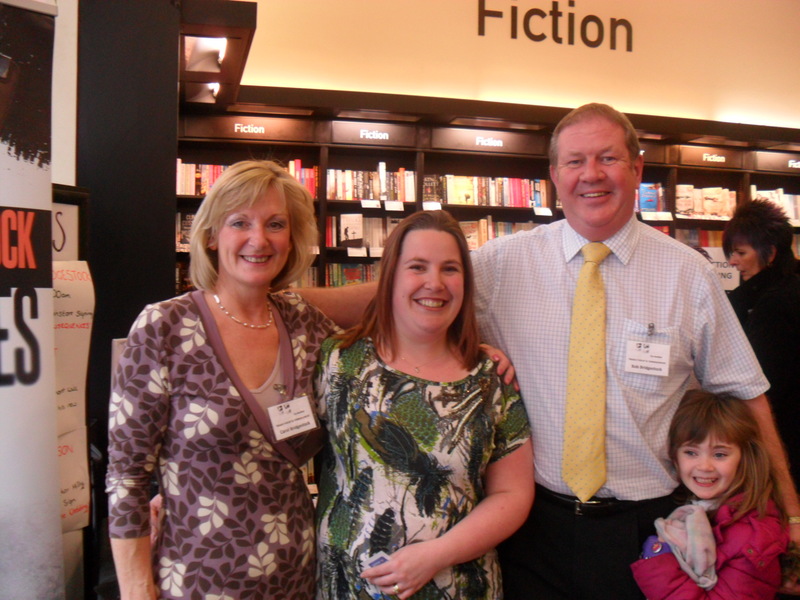 The first was a lady by the name of Mavis Beanland who we both remembered really well. 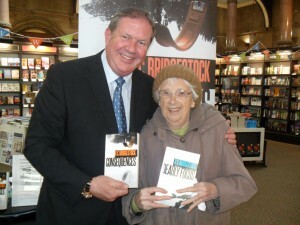 We met her in Bradford Wool Exchange and Mavis told us she is a real fan of crime fiction. We actually took a picture of Mavis with Bob for our blog that day! 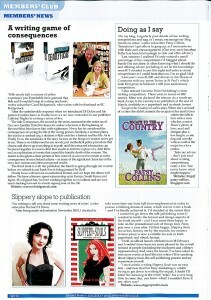 She will be helping the team solve a crime in Book four of the series which is called ’Snow Kills’! Well done Mavis! The second name chosen was Daniel Jones who wanted to specifically be a Forensic Pathologist in a novel, he said on his entry. He will be helping Dylan and his team in Book 5 of the series. There were so many fantastic names we could use for characters in our hat and if we can use more of these in the future we will do. Before we do we will obviously let you know. Until then… keep reading and enjoying! And now… we better get writing! 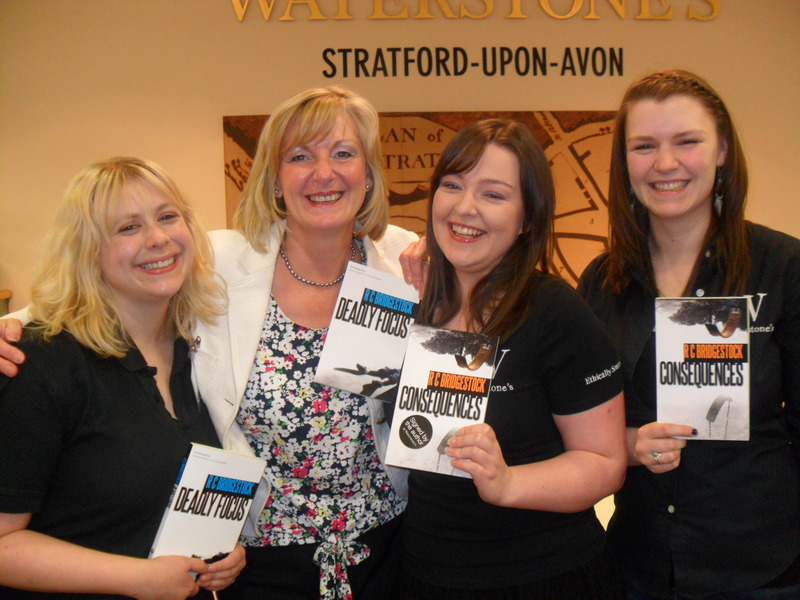 The ultimate – book signing in Stratford Upon Avon at the ‘Shakespeare Celebrations’! 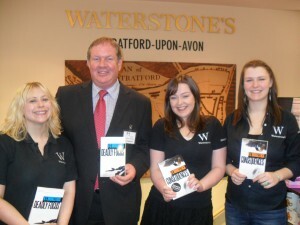 WATERSTONES , STRATFORD UPON AVON, WARWICKSHIRE. Upon Avon without thinking of William Shakespeare? Born 23d April 1564 and died 23rd April 1616, aged 52. William Shakespeare was born on Henley Street. We stayed at the beautiful Alveston Manor, which is just over the bridge from the town centre and within walking distance of Waterstones. Alvestone Manor is a magnificent Tudor building with many authentic features, whilst the gardens boast an ancient Cedar Tree under which, rumour has it, the first performance of ‘A midsmmer Night’s Dream’ was given. 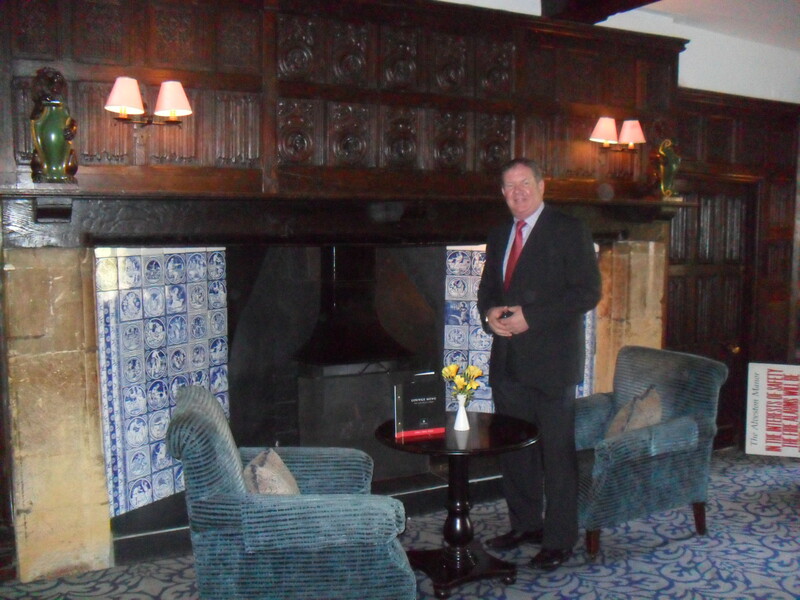 The Lord of the Manor – or just Bob? The Restaurant staff! Thank you guys you were terrific! Onboard for a trip down the river! 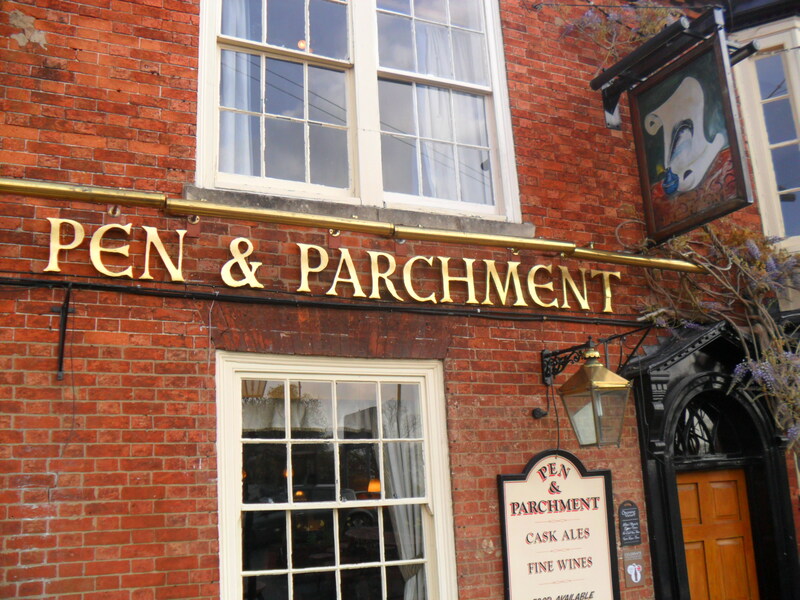 Passed the pub named none better than the ‘Pen & Parchment’! 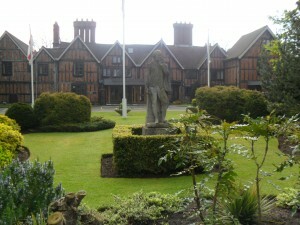 The Gower Memorial where Shakespeare presides over his characters in the garden below. William Shakespeare and Lady Macbeth at his feet. We arrived at Waterstones who had given us a window display. 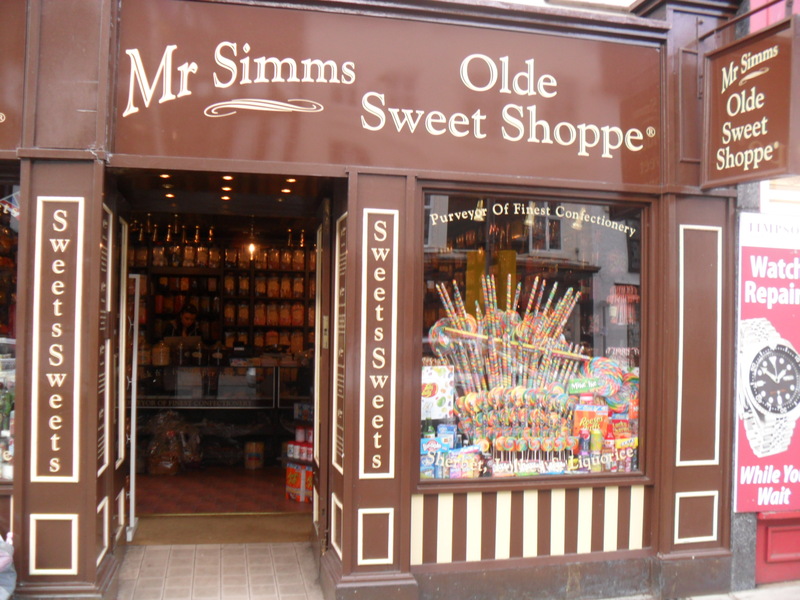 The book shop is opposite Mr Simm’s Olde Sweet Shop and we had the most amazing sandwiches, with bread to die for, from the ‘Hathaway Tea Rooms’ a few doors away! 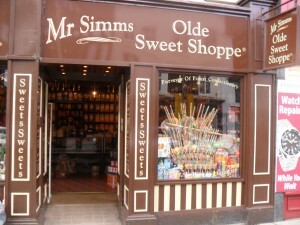 If you go to Stratford these shops are not definately not to be missed! 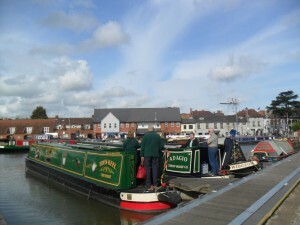 There was a great atmosphere in the town. 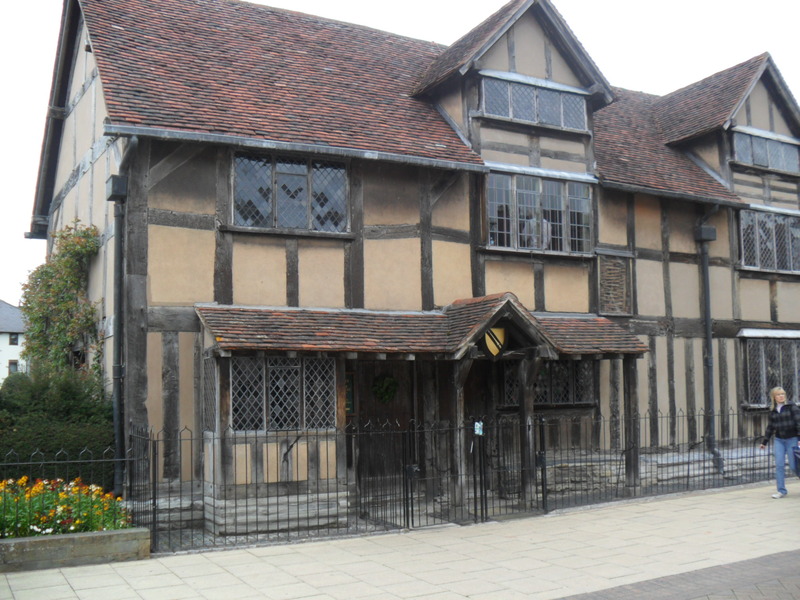 ‘George & The Dragon’ passed us by, and the whole town it seems were celebrating Shakespeare’s life on the anniversary of his birthday and world book week. We felt very humbled to be signing our novels, in this town, on this special day. Rick and Marie Montero were staying in our hotel. 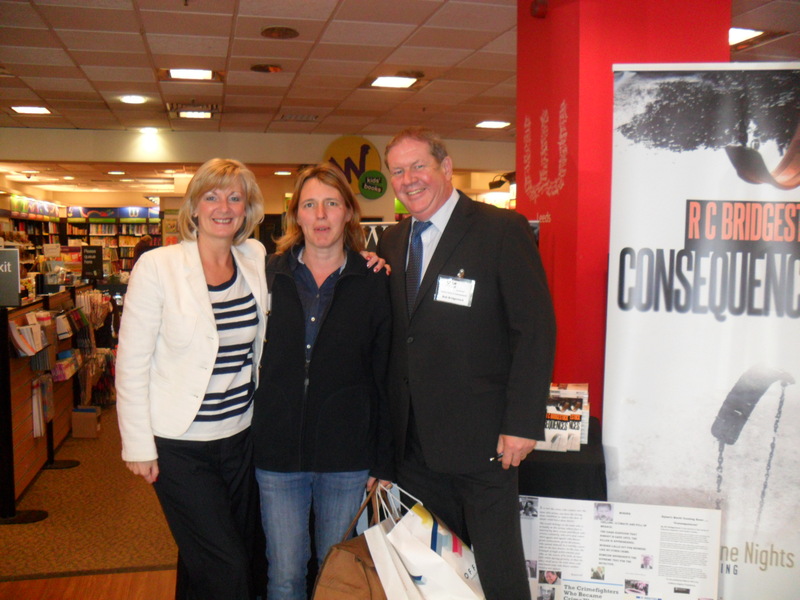 These lovely people were from Conneticut and came to see us and get a signed copy of our books – we will stay in touch! Illa & Chris! Come on Illa get those short stories submitted! Richard Pauley came to see us all the way from Birmingham to get a signed copy of ‘Consequences’ for him and Lorna Mapley! 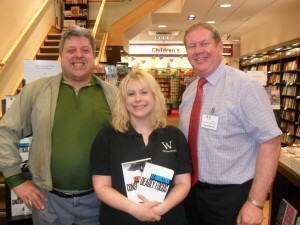 Here with Deputy Manager Sara Griffiths and Bob. 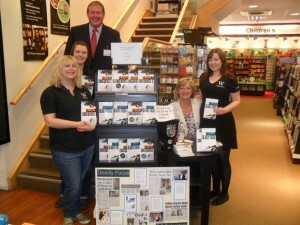 Bob, Josie Ayres, Deputy Manager Sara Griffiths, Carol and Elin Lewis. 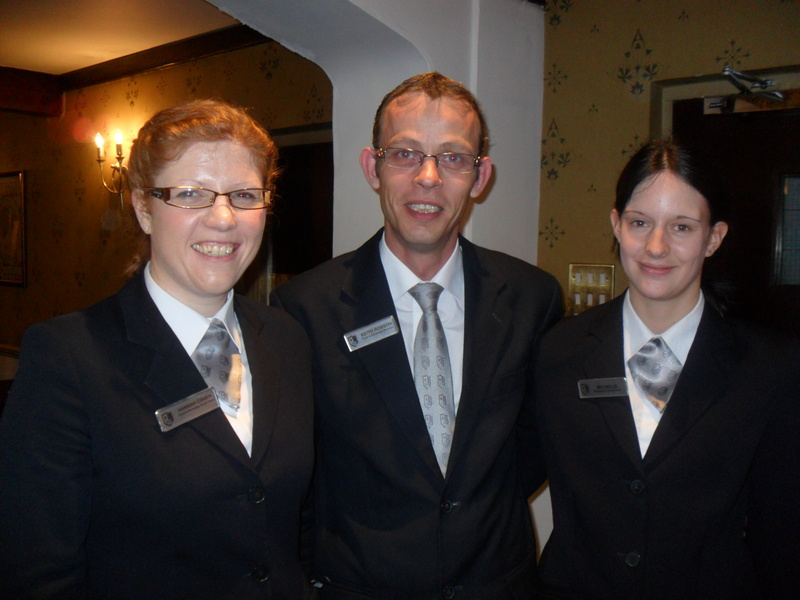 Deputy Manager Sara Griffiths, Bob, Elin Lewis and Josie Ayres. The Girls! Deputy Manager Sara Griffiths,Carol,Elin Lewis and Josie Ayres. Tomorrow we head home and there is lots more news to come yet! 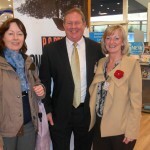 Huddersfield – ‘Deadly Focus’ goes to No.10 in the top 30 Watestones charts this week! 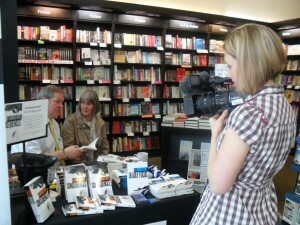 Calendar TV out to film book signing! The imposing ‘Castle Hill’ towers above the industrial town of Huddersfield. The tower it self stands 900 feet above sea level and was completed in 1899 to celebrate the anniversary of Queen Victoria’s reign and can be seen for miles around the Kirklees area of West Yorkshire, Bronte Country. Not surprisingly our novels are based in Harrowfield, a fictional town based loosely on Huddersfield and Halifax where our Yorkshire Detective Jack Dylan and his partner Jen works. Today we were back on home turf and therefore we have lots of news and pic’s as we met up with old and new friends. ‘Deadly Focus’ whizzed into the No. 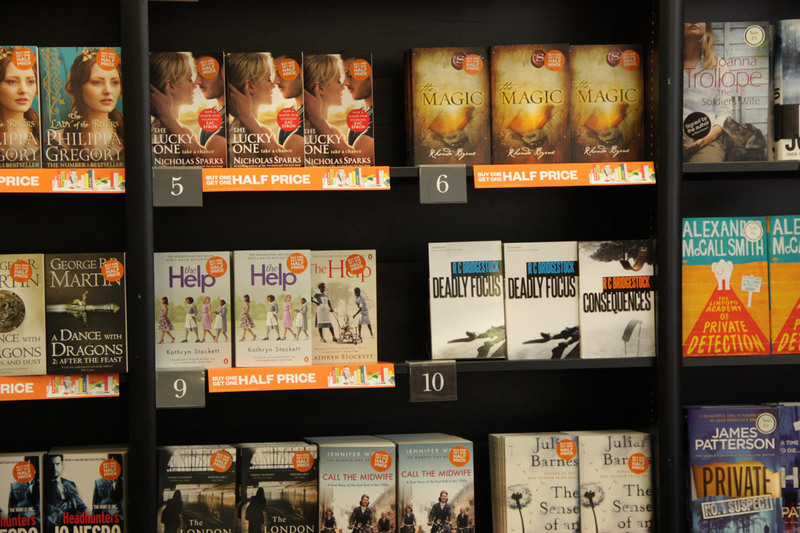 10 spot in the top 30 bestsellers in Huddersfield on Wednesday – never known before for a local author. No. 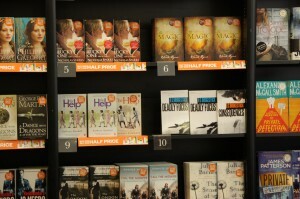 10 in the Bestseller table before we got there! And just look at whose around us! Wow! Once again Calendar TV was out to film us. Infact you might have seen Victoria later on reading Calendar news – she’s a girl with many talents! 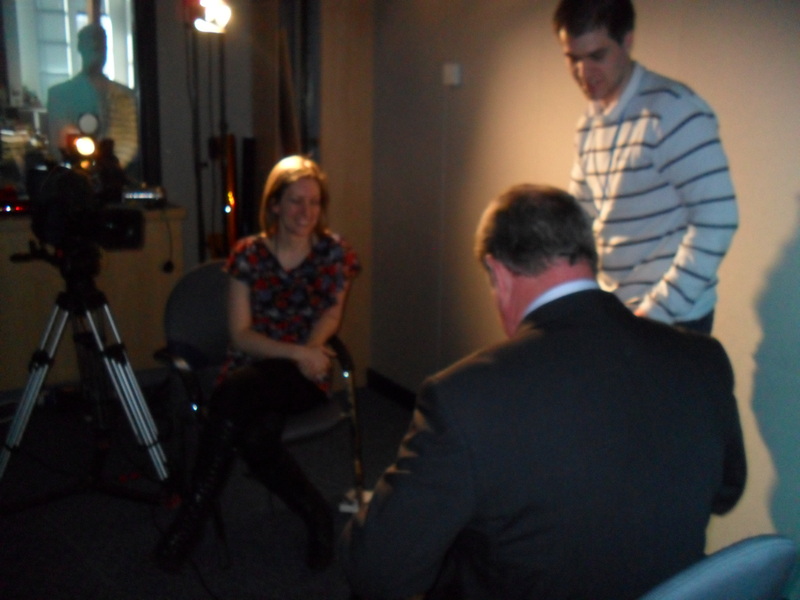 Victoria Whittam filming Bob and his first (CID partner) Yvonne for Calendar TV. 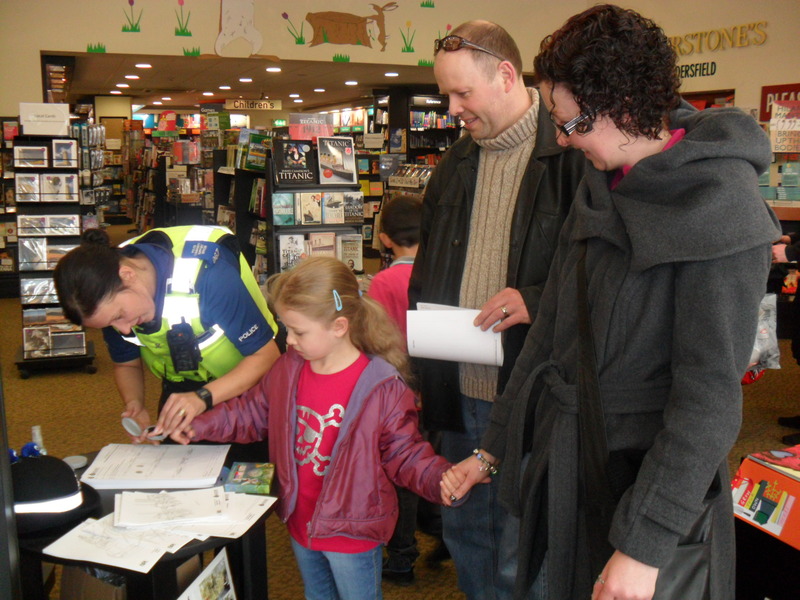 Local police came out to mingle with the community, taking fingerprints which was fun for the children and handing out advice to the local people. My ‘little’ brother Steve, Bob, Carol and Sister in law Amanda! Here are a few pic’s of the day. 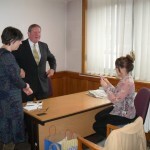 Bob signing a book for the first partner he worked with in CID Yvonne (Katy). He hasn’t see her for 30yrs and all being filmed by Calendar TV! 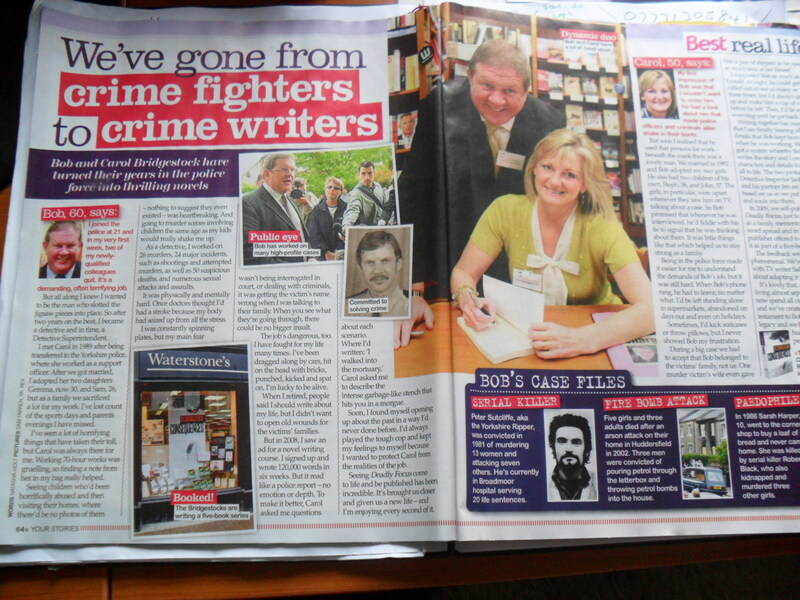 Bob says Yvonne was one of the best detectives he ever worked with – if not ‘the’ best. Being filmed for Calendar TV. And here is our PC Tracy Petterson (Consequences)! 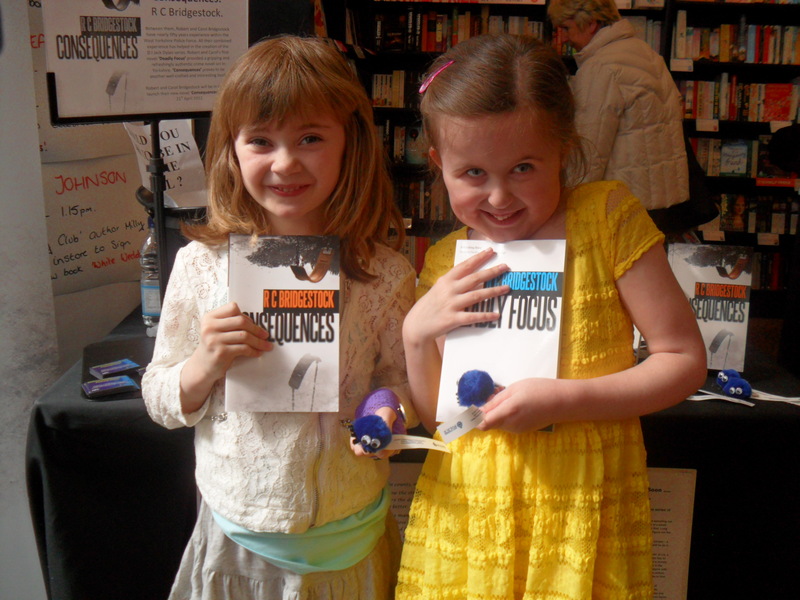 Our Grand daughter Hermione (left) and her friend Grace proudly show off Nana and Grandad’s books! Some of the wonderful staff at Waterstones Hudds who kept us supplied with refreshments! Thank you so very much! 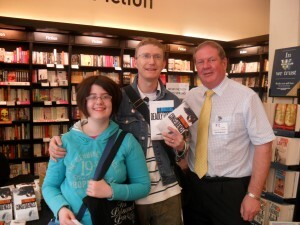 Joanna and Andrew who came all the way from Scarborough to see us! Thank you so much guys it’s much appreciated! 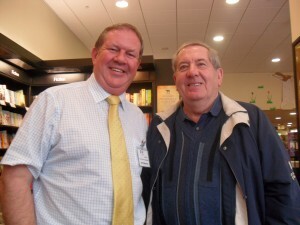 Bob and retired Detective Roger Parnell – another of Bob’s colleagues. 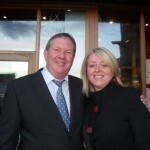 who did an incredible 36 years loyal service! 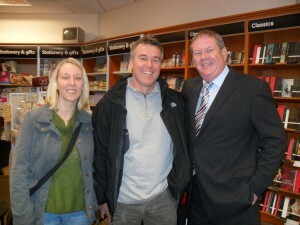 Our six months pregnant daughter Gemma came to see us with her hubby Andy! Next time we travel north to see Gemma we will have another grandchild! A special event for the day in our home town. Huddersfield customers only. Amanda picking the name out of the hat …. drum roll…. 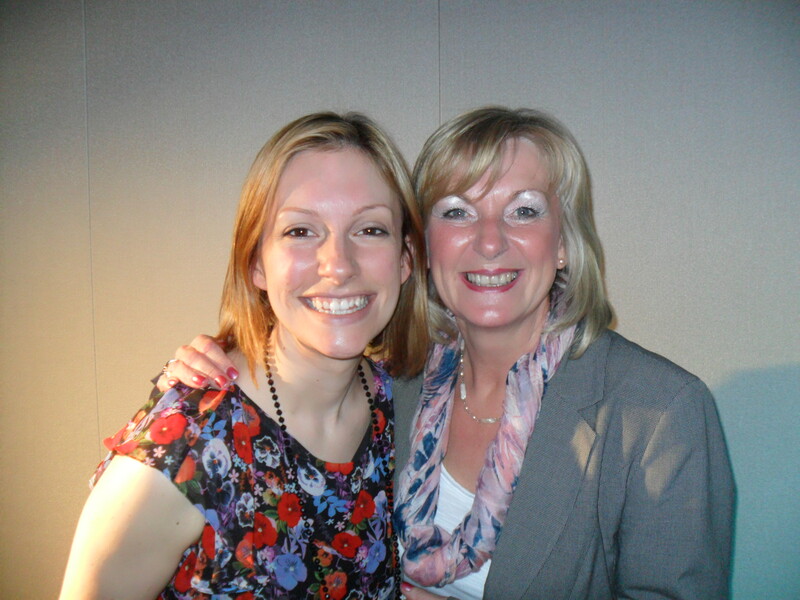 and Fearne Robinson will appear, character named in book 5 of the ‘Dylan’ series! And last but definately not least our son John! 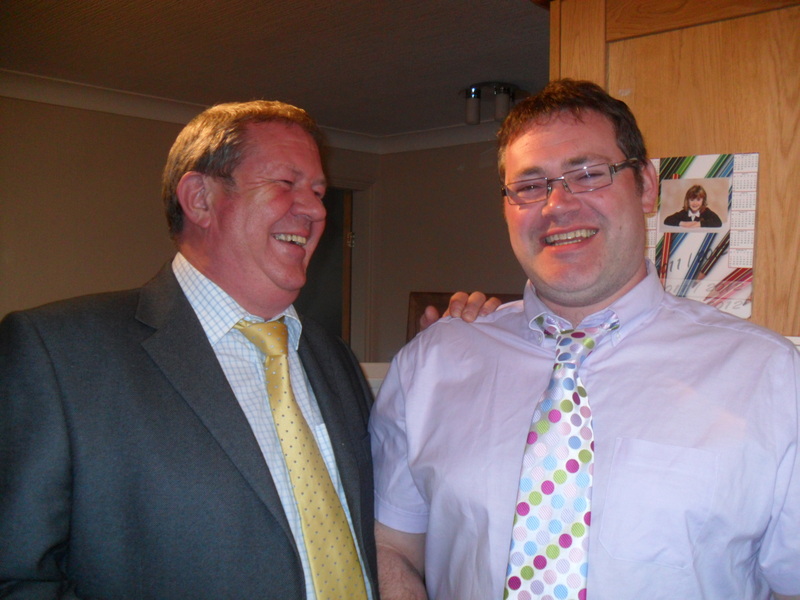 Once father and son start laughing there is no stopping them! 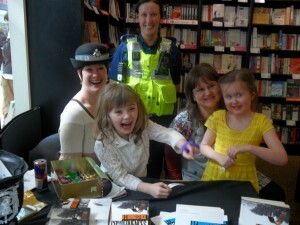 And we leave Waterstones Huddersfield, tired but very happy to have seen so many lovely smiling, happy faces. 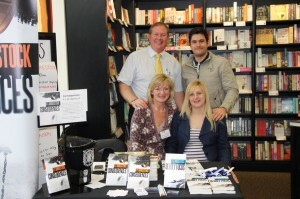 See you again soon guys with the third in the Dylan series ‘White Lilies’! 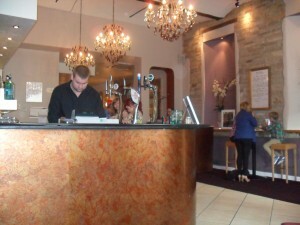 Tea at the lovely Prego’s in Brighouse! Tomorrow we will travel to Stratford Upon Avon. We will be signing books there for World Book Day! Excited! Calendar TV Film Crew Visit Sheffield Waterstones Event! We woke up today to sunshine – at last! Although by the time we had travelled to South Yorkshire, through Huddersfield and over Penistone it had rained, sleeted and even hailed! 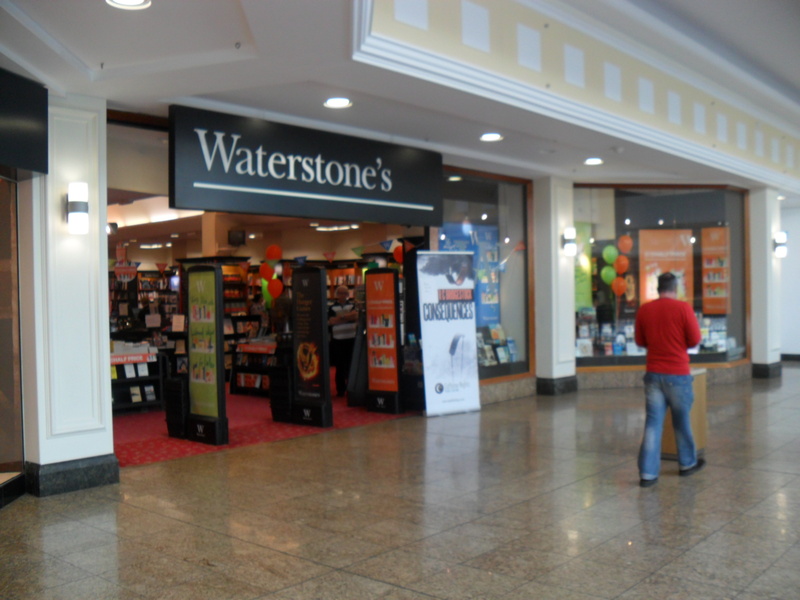 Today we were signing copies of our books at the magnificent Meadowhall Shoping Centre which opened in 1990 and guess what? Waterstones is right next to Marks & Spencers my favourite shop! First to greet us on entering the store was the ITV Calendar TV crew who had come all the way from Leeds to film us in the store signing books and speaking to the customers. 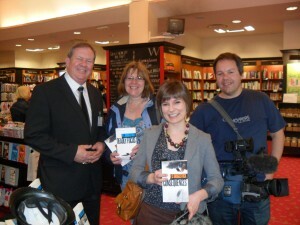 Bob, Janice (who the film crew interviewed) and the film crew from Calendar TV! Sheffield has been renowned for it’s production of knives since the 14th century, and by 1600 it had become the main centre of cutlery production in England.. In the 1740s the crucible steel process was improved. At about the same time, the silver plating process which produced Sheffield Plate was discovered. History reveals that Sheffield has seen occupation since the ice age. On our way home we passed the ground of Sheffeld Wednesday FC. Many of you will remember the tragic event at the Hillsborough Stadium on the 15th April 1989. The Hillsborough disaster. was a human crush which occurred during the semi-final FA Cup tie between Liverpool and Nottingham Forest football clubs.. The crush resulted in the deaths of 96 people,[ with a total of 766 other persons being injured. All of them were fans of Liverpool Football Club. The Hillsborough disaster remains the deadliest stadium-related disaster in British history and one of the worst ever international football accidents. 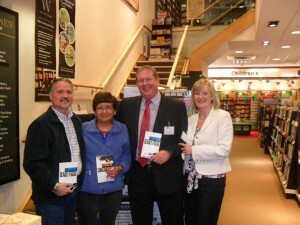 The official inquiry into the disaster, the Taylor Report, concluded that “the main reason for the disaster was the failure of police control.”The findings of the report resulted in the elimination of standing terraces at all major football stadiums in both England and Scotland..
Last book signing event in the north tomorrow. 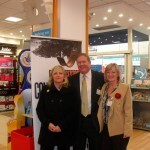 The feature that we were interviewed for on Wednesday will appear in the Halifax Courier 28th April 2012. Also the piece and the picture taken at the Bradford book signing will appear in the Telegraph & Argus. 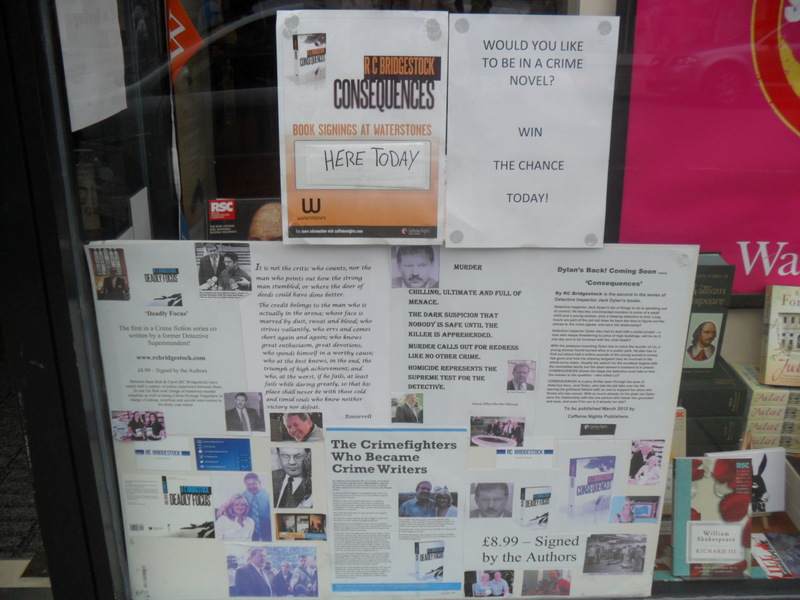 We are so looking forward to the Hudderfield, Kingsgate book signing event tomorrow as there are many exciting events planned! 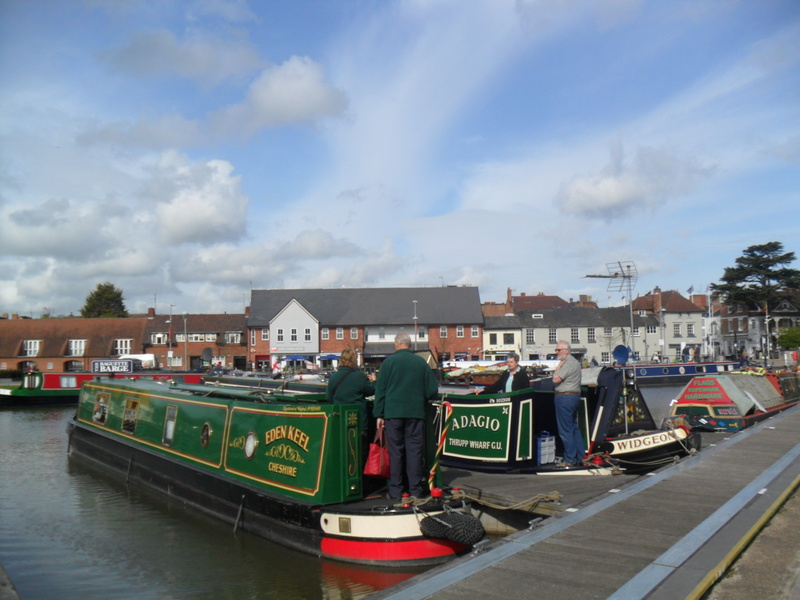 Why not come along and see us! For now and until tomorrow – Night All! 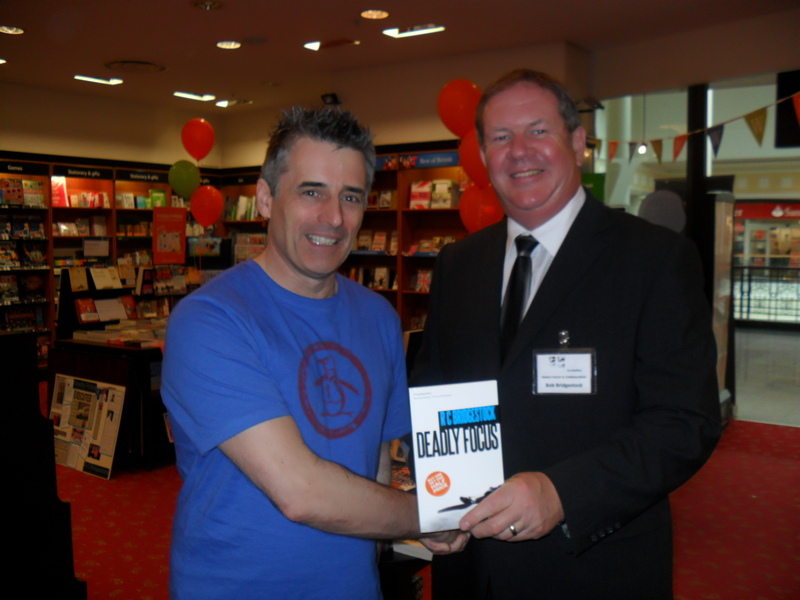 Winner – And at the end of the tour a customer from the Sheffield store by the name of ‘Daniel Jones’ as a Forensic Pathologist, has been picked out of the policeman’s hat to appear in one of the novels in the ‘DI Dylan’ crime series! WATERSTONES – THE RIDINGS CENTRE – WAKEFIELD and the excitement of CALENDAR TV – LEEDS! 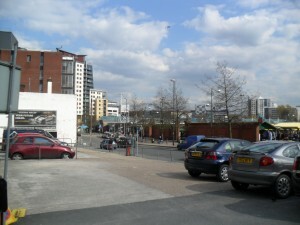 The ridings centre was built in 1993 and this is where we were today! We we were humbled by a visit from the man who Bob will always call ‘Boss. Retired Detective Superintendent Tony Ridley. 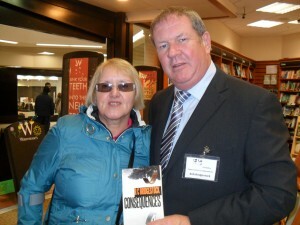 Mike Wild who came to see us to collect a copy of ‘Consequences’ for his mum Pat Wild who is 81 today! Happy Birthday Pat from Bob and myself! 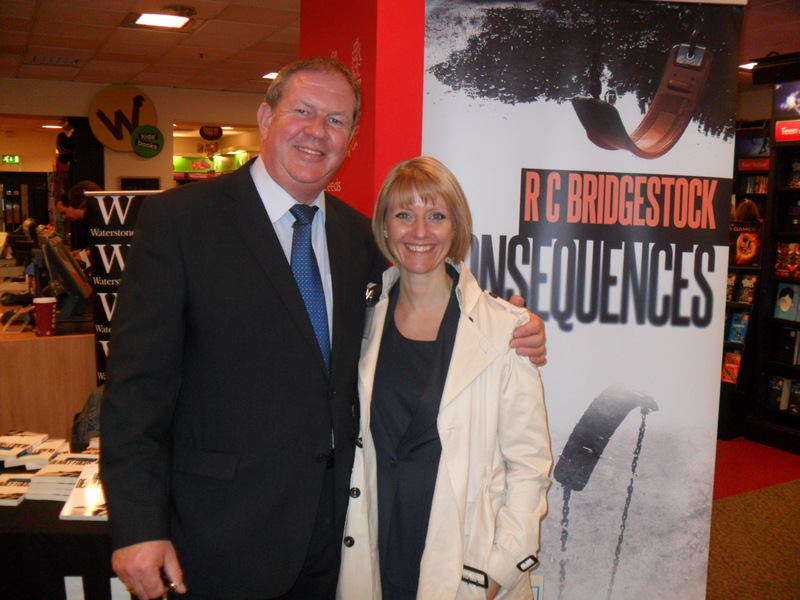 And last but not least our lovely sister in law Marcia Bridgestock braved the downpour to come into the store to say ‘hello’ and get her copy of ‘Consequences’. 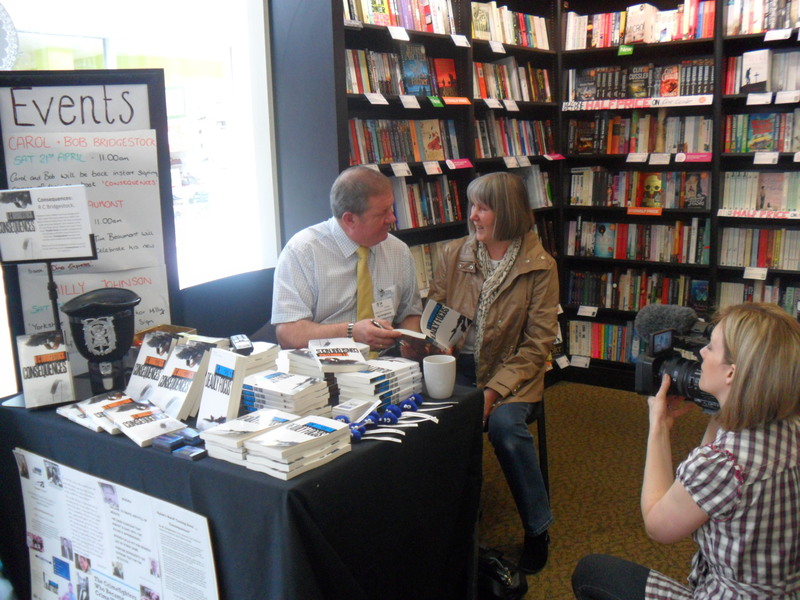 However, when we arrived we were told that they would like to interview us seperately and also come out to film us at a book signing which would mean they could do a short film piece on us. 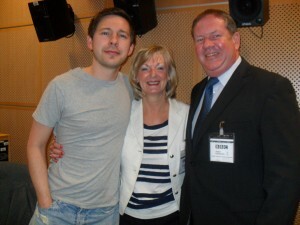 We were taken into a beautiful interview room with plants ‘an all – past all the well known people that you see on TV – Duncan Wood, Gaynor Barnes, Chris Kiddie and many more shook our hands – we felt like stars! 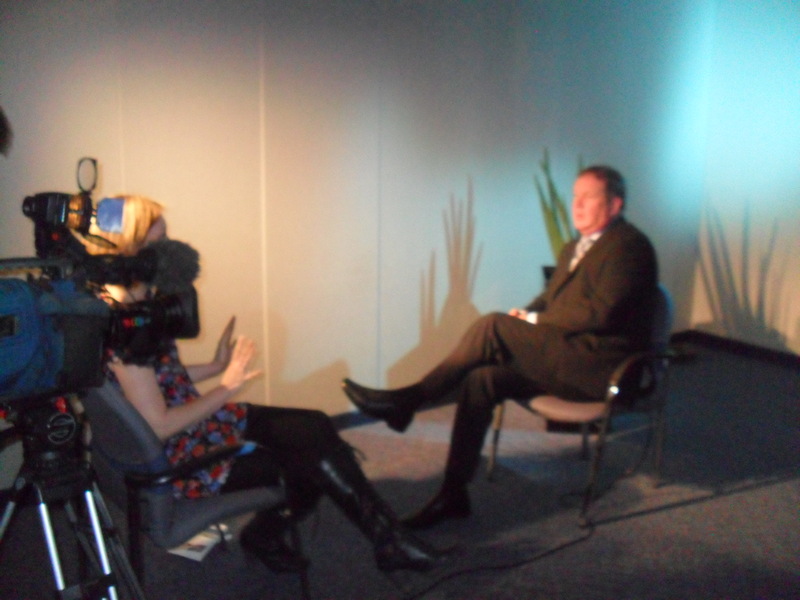 Here is a few pictures for you and we will update you as soon as we know more regarding dates when it will be aired! 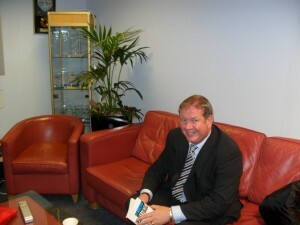 Bob in the ‘Green Room’ just off the working hub of the newsroom! 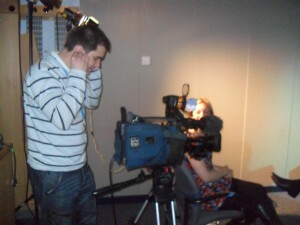 The very clever cameraman sets the lights and camera for action! Bob being interviewed by Victoria and filming taking place! Bob having his microphone fitted. 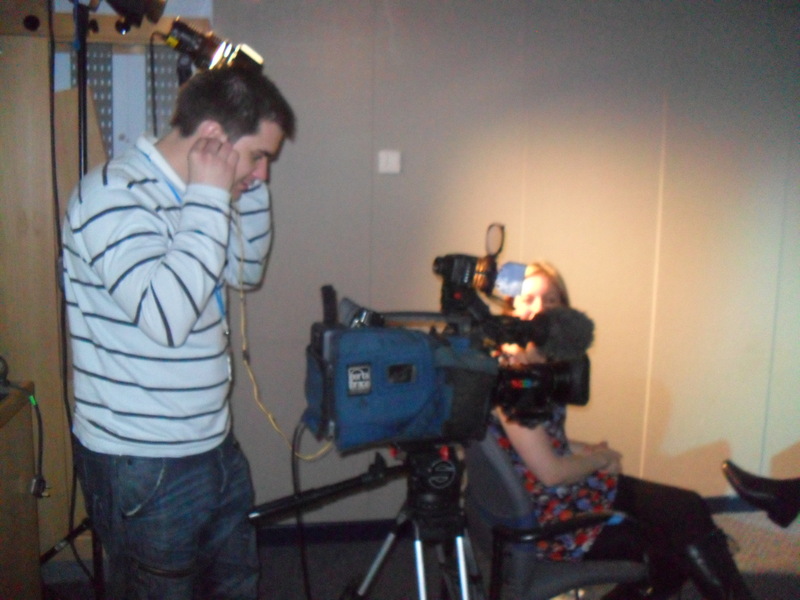 It’s all change for our joint camera shots at the end of our interviews. 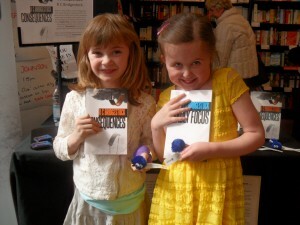 It will be a long day tomorrow as we head to Sheffield and will be signing copies of our books in Waterstones Meadowhall so if you’re around come see us and say ‘Hello’! Off to bed for us now! Halifax is our home town. Bob & Carol were both born in Halifax General Hospital! Bob lived in the ‘Old Railway House’ at Ovenden where his dad worked for the Railway and Carol lived in King Cross. They both attended School’s in Halifax. We woke up to rain in Halifax today and it never let up. 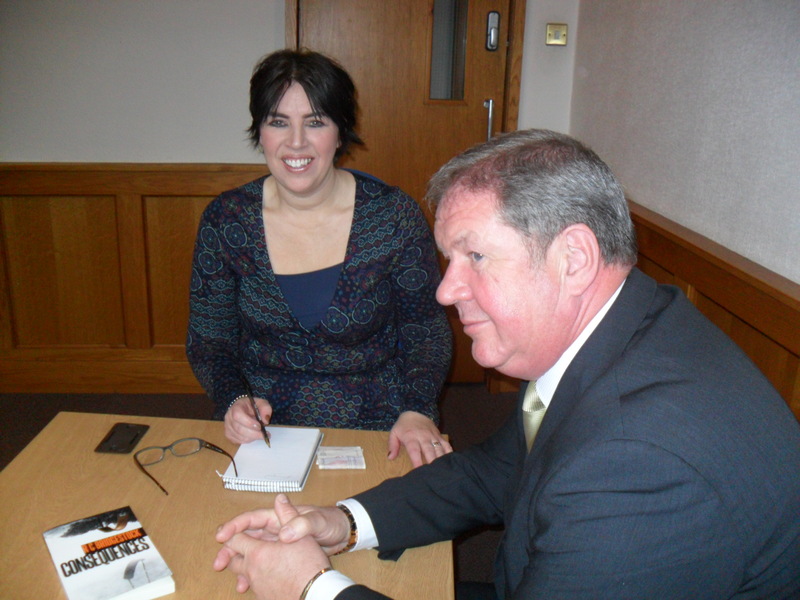 By the time we reached the town the heavens had opened and we made a dash to the Halifax Courier Offices to see Virginia Mason for an interview for the Halifax Courier. We were soon to learn some very sad news as the ‘life blood’ of Halifax for 120 years - ‘The Courier’ is to go to a once weekly pnewspaper from a daily issue. To say this is a sad day is an understatement – my dad even reads the newspaper every night on line from the Isle of Wight! 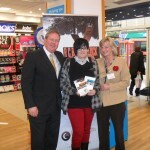 Johnson Press please reconsider how can you do this to the people of Halifax? Believe it or not this topic of converstion was the one each and every customer spoke to us about today – everyone in the town is truly shocked. 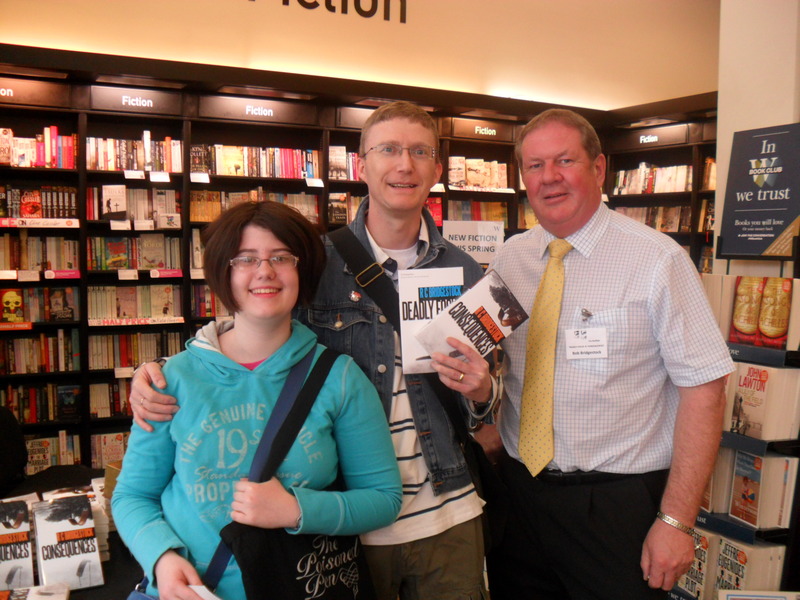 Our interview should go in the newspaper on Saturday and here is Virginia and Rebecca who is on work experience interviewing Bob and myself. 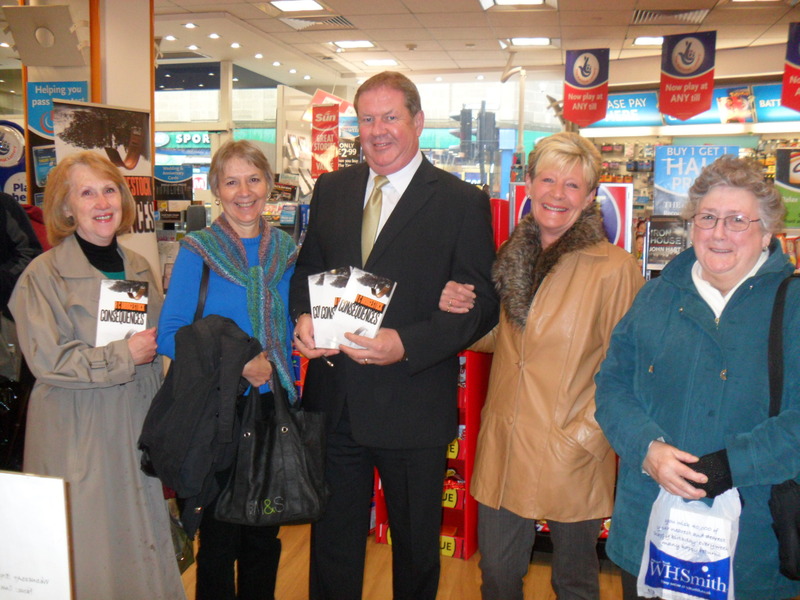 Even the heavy rain didn’t stop people coming into WH Smiths to see us! 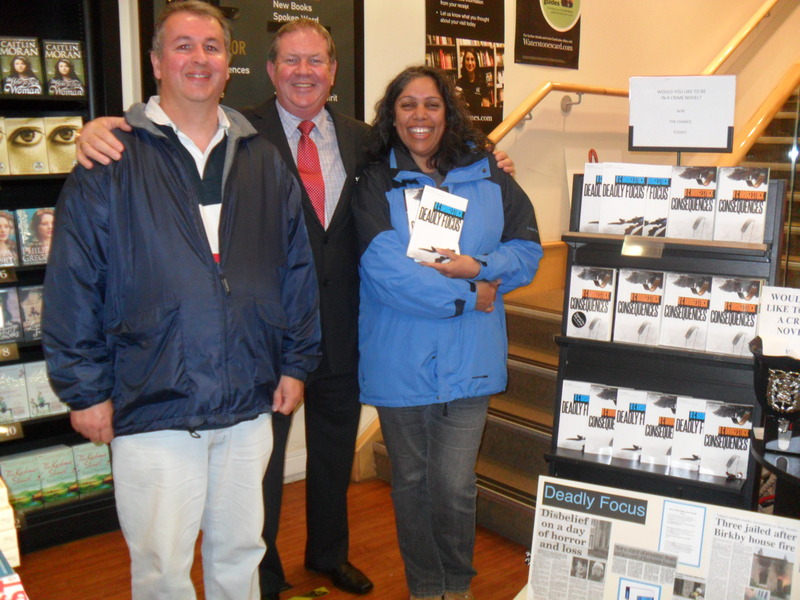 We’ve had a wonderful day catching up with friends and many lovely people of Halifax. Here are just a few! 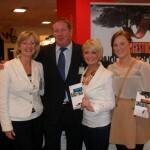 Some of our Admin team at West Yorkshire Police! 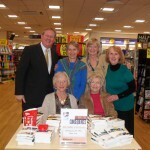 Bob, Janet, Carol, Dorothy,Beryl and Margaret. Busy day tomorrow! 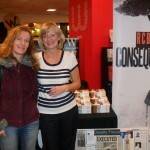 Join us in Wakefield, Ridings, Waterstones if you can! Then we will be going on to Calendar TV!!!!!!!!!!! All excitement here! Will update you tomorrow night but for now I’ll leave you with a few interesting facts about Halifax. The home of Percy Shaw, who in 1935 invented the remarkable ‘catseye’ reflecting road studs, is in Boothtown, Halifax, West Yorkshire – Carol’s auntie Mary cleaned for him for years! Charles Dickens in 1860 after the reconstruction of the borough market denounced it as a dreadful place. We obviously don’t think so. It boasts some wonderful historic buildings. Waterstones – The Wool Exchange Bradford has to be the UK’s most beautiful bookshop. WATERSTONES – THE WOOL EXCHANGE, BUILDING BRADFORD. 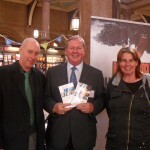 Wet and windy start to the day, however Waterstones in the Wool Exchange builidng in the centre of Bradford is a fantastic location for a book signing. 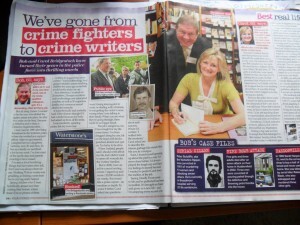 Here’s a few pictures for you, although they don’t even begin to show you the splendour of the magnificent bookstore – followed by a few interesting facts about Bradford and it’s less savoury characters! 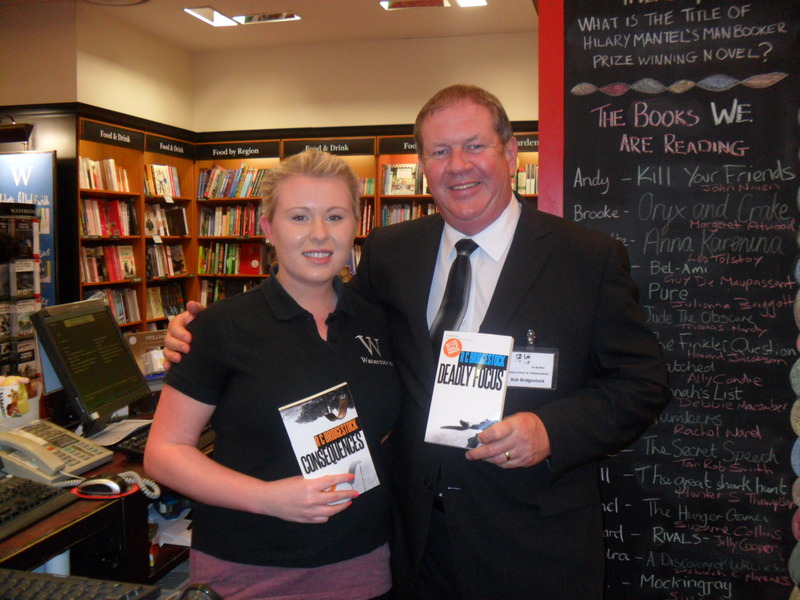 Winner – DI Dylan’s latest recruit! The lovely Mavis Beanland! We were lucky enough to get a picture of this lady at the book signing too! 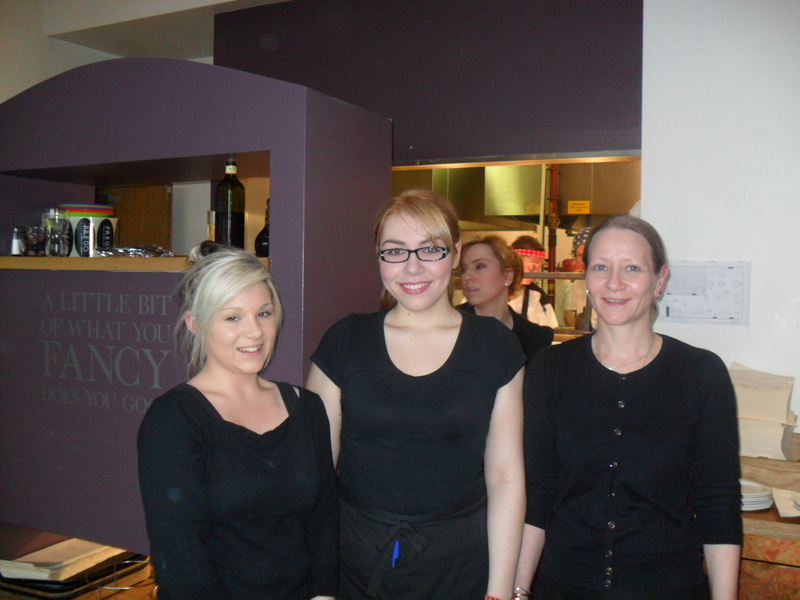 And the day rounded off with a visit to Prego’s in Brighouse with our best friend Grainne! 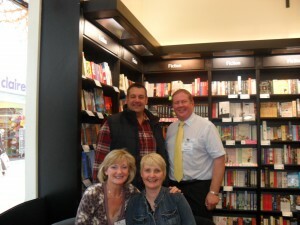 As you can see we caught up with some old friends and met some wonderful people. 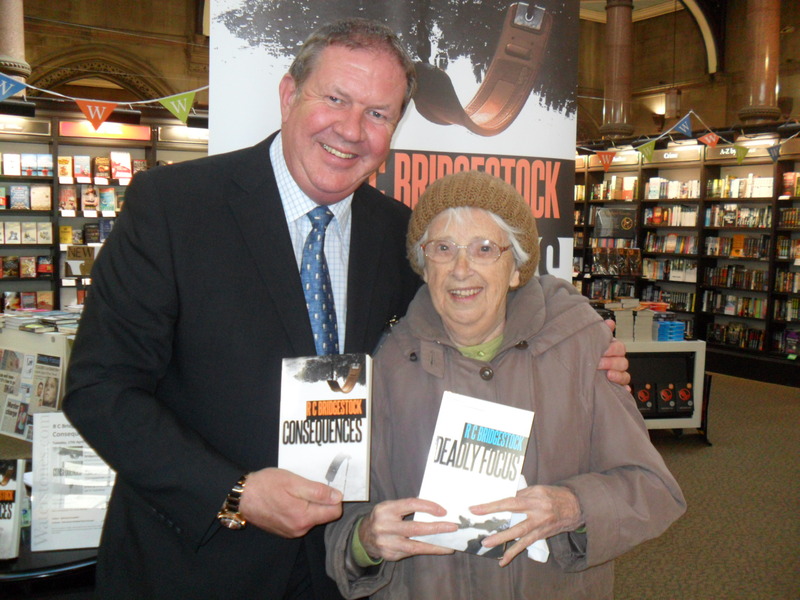 DI Dylan’s found a new recruit is Mavis Beanland, and be warned she carries her stick with her everywhere! Mavis called into Waterstones with her daughter Janice today and what a wonderful time we had with them. 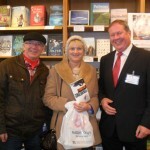 Mavis will be featuring in a future DI Dylan novel so watch our for her! 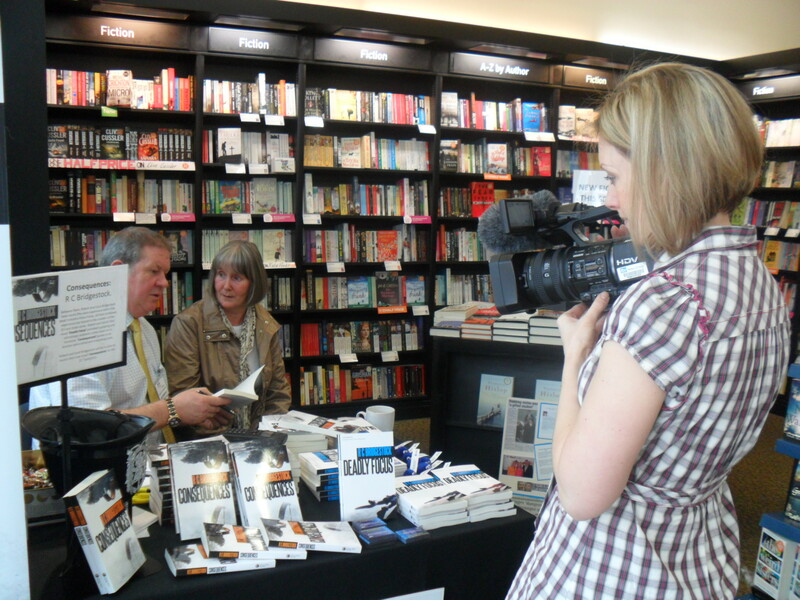 Halifax WHS tomorrow after interview with the feature editor at the Halifax Courier and Yorkshire TV on Thursday but we will update you with that news later! Exciting times to come on our tour! Bradford began as a village by a ford. Brad meant broad, By the time of the doomsday book 1086 there were around 300-350 people a large village. It was turned into a town when villagers were allowed to hold a weekly market. As the town developed the woollen mills were described as, dark & satanic workplaces. Mass immigration in 1851 from Germany & Ireland saw the population rise from 6,000 to an incredible 103,000. Today its population is around 467,000. At the end of the tour the person chosen to be character named in a ‘DI Dylan’ novel is Mavis Beanland! 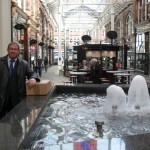 Leeds is regarded as the financial capital of the north and lies at the centre of Yorkshire! http://www.caffeine-nights.com/news.html - Interview on Radio Leeds – Wes Butters Show! Today was an early start for what was going to be an exciting day. Getting into Leeds for 9am was daunting for us ‘Islanders’! I don’t think there are as many people on the Island as we saw on the leeds ring road. 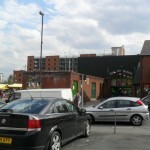 We had all good intentions of parking in the Albion Street Car Park which is only a few yards from Leeds Waterstones but ended up in the Market car park due to the one way system. 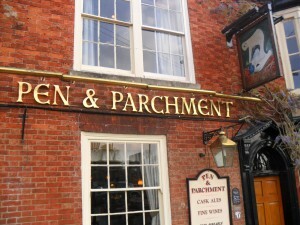 At least we were parked and this is the place where PC Vicky Hardacre is sent to in ‘Consequences’ … so here’s a pic! 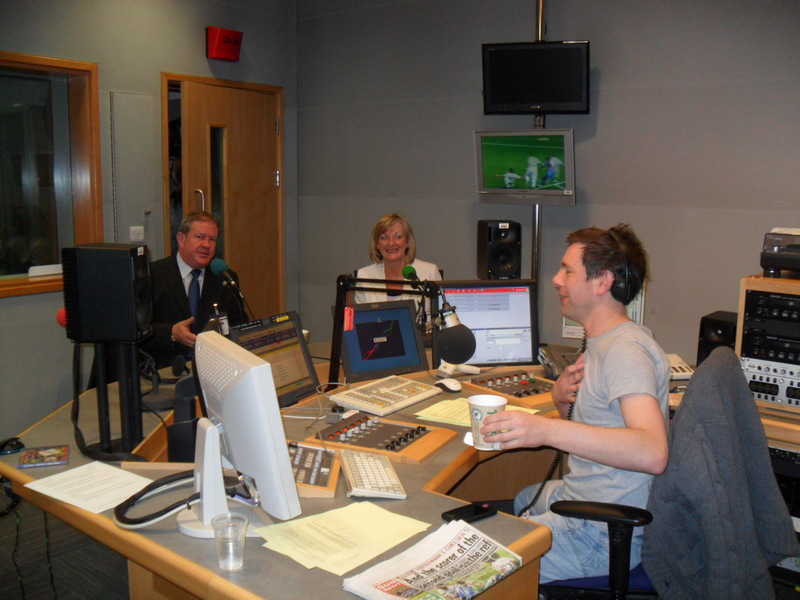 We arrived at BBC Leeds at 10am just in time to see Brian and the Skunk leaving the studio where we were being interviewed next – how could we follow that? Bob had a word to see if he could give us any tips! 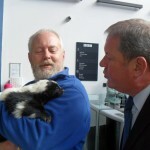 Bob with Brian and the Skunk! 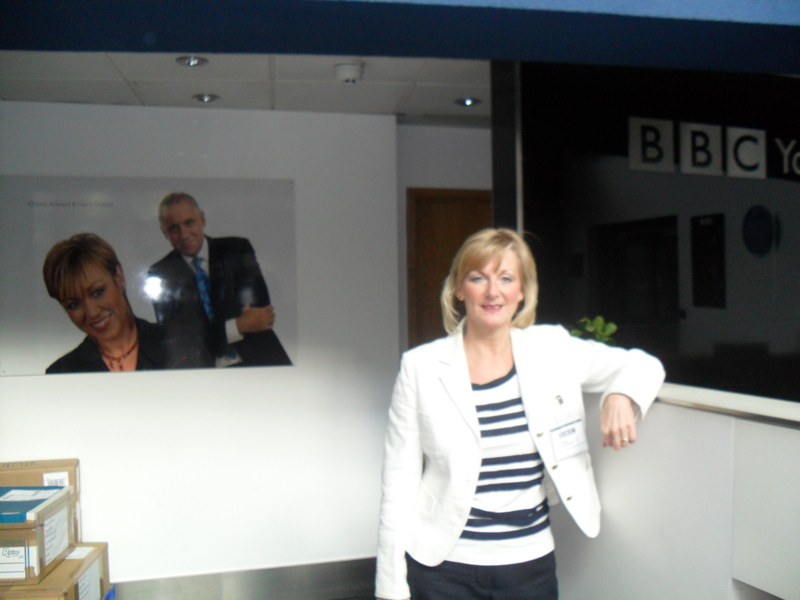 We had a warm welcome at BBC Radio and if you’ve never been I thought you might like to see a few pictures both inside and out so here goes! 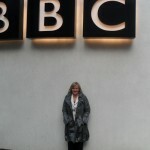 Carol outside BBC Radio Leeds. 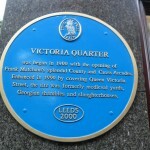 From here we walked over Leeds city – through the Victoria Quarter and towards Waterstones, Albion Street. 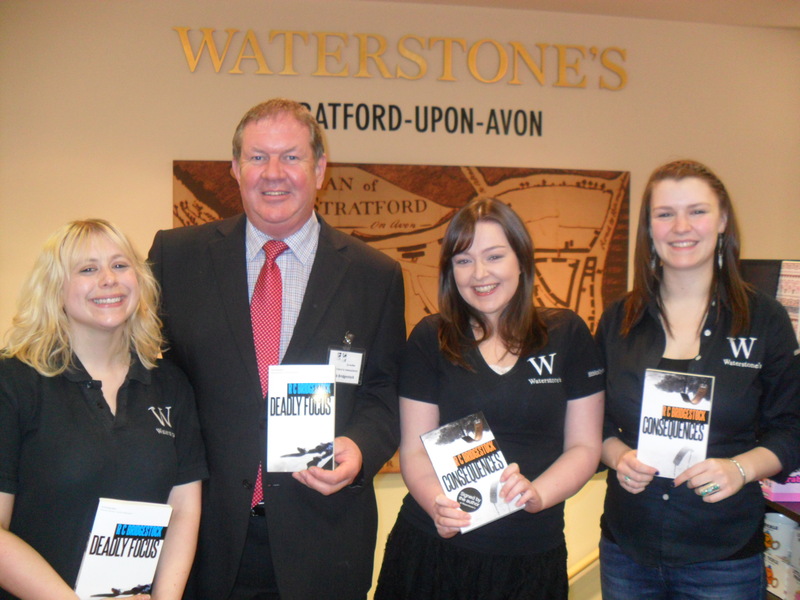 There was a warm welcome at Waterstones. The management had given us a great postion in the front of the main doors and we had a splendid table display. 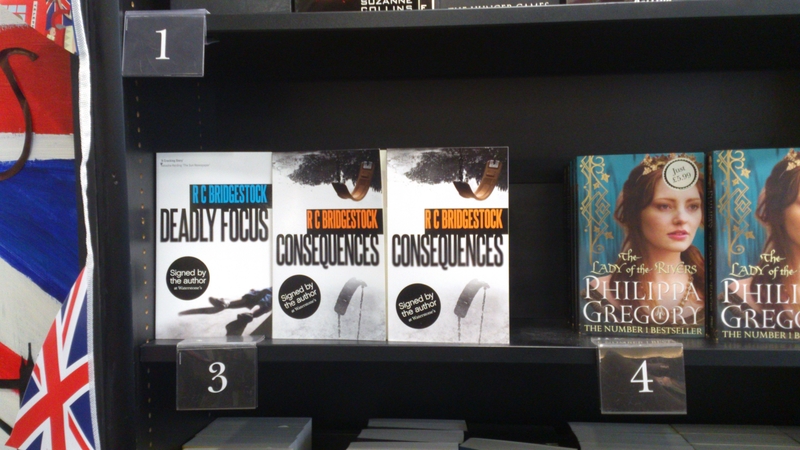 Here we saw a few character named people in ‘Deadly Focus’ and ‘Consequences’. Lisa from the CID office! 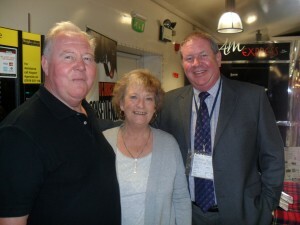 And then we caught up with Sue Everett Writer, Director and script consultant – always lovely to put a face to a name and meet in person isn’t it? All in all we’ve had an eventful day and looking forward to our trip to what is known as the most beautiful Waterstones stores in England tomorrow – Watestones Woolshops in Bradford. I’ll leave you with some interesting facts about Leeds and it’s prison…. Night All! By the time of the doomsday book in 1086 Leeds had a population of around 200 still a large village. 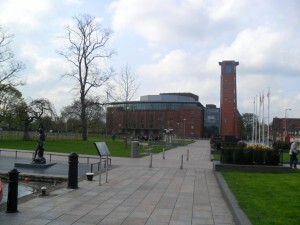 Today this finance centre in the North as a population of around 715,000. During the war 77 people were killed by bombs and 197 buildings destroyed. Lesley Susan Molseed (14 August 1964 – 5 October 1975) was an eleven-year old girl from Turf Hill, Rochdale, Greater Manchester, who was murdered on Rishworth Moor in West Yorkshire. Stefan Ivan Kiszko (24 March 1952 – 23 December 1993), a 23-year-old local tax clerk of Ukrainian/Slovenian parentage, served 16 years in prison after he was wrongly convicted of her sexual assault and murder. His ordeal was described by one MP as “the worst miscarrages of justice of all time.” Kiszko was released in 1992 after forensic evidence showed that he could not have committed the murder. He died in December 1993. Ronald Castree was eventually found guilty of the crime on 12 November 2007. The team who finally brought Ronald Castree to justice on the cold case review of the Molseed Enquiry worked out of Bob’s CID office at Richmond Police Station, Halifax. All of those dedicated officers we are very proud to say are personal friends. WH Smith – Leeds/Bradford International Airport – Celebrating 80 yrs! 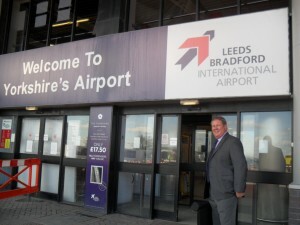 LEEDS BRADFORD INTERNATIONAL AIRPORT—-Celebrating 80 years. In 1931 it was originally known as Yeadon Aerodrome but by 1939 all civil flying ceased with the outbreak of war. During the war years more than 4,500 aircraft were built at the AVRO factory adjacent to the airport. 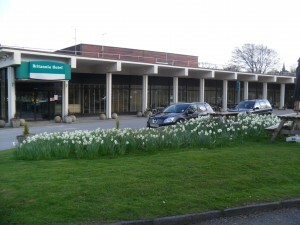 The 23million pound project commenced in 1982. 1996 it’s millionth passenger passed through. 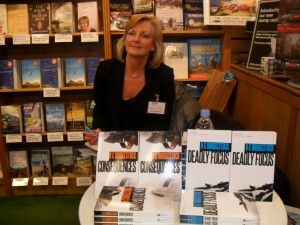 The book signing journey continues today! A picture of our hotel Britannia as promised! Ideal if you need a short stay for airport as it is only 2 miles away but Bob says beware as the toilet in the room is one you have to reverse into! Food’s good though and it’s clean Britannia Hotel – Leeds/Bradford Airport! It’s been amazing who walks through the doors at a book signing! Friends we haven’t seen since we left the job wandered into the building and their mouths dropped open to see us both standinng there! 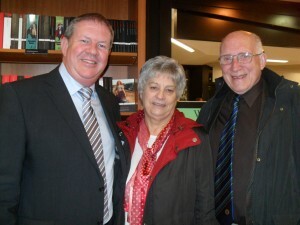 Here’s Terry & Pat Homer on their way to Cyprus to see their daughter. 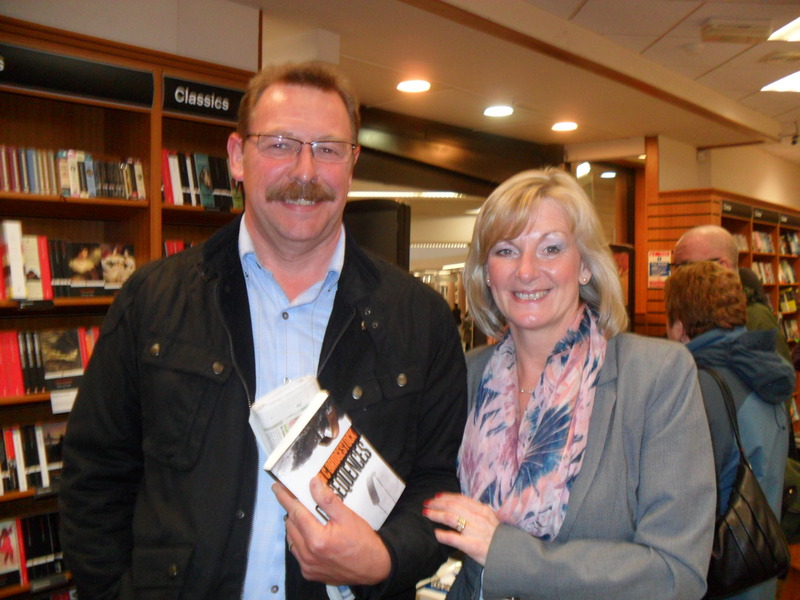 Terry worked with Bob at Wakefield International Police Training School and they now live in North Yorkshire – their plane was two hours delayed so lots of time to catch up! Around dinnertime we were the ones to be surprised as our son and daughter in law walked in with our grand daughter Hermione! Lot’s of cuddles for Nana and Grandad! 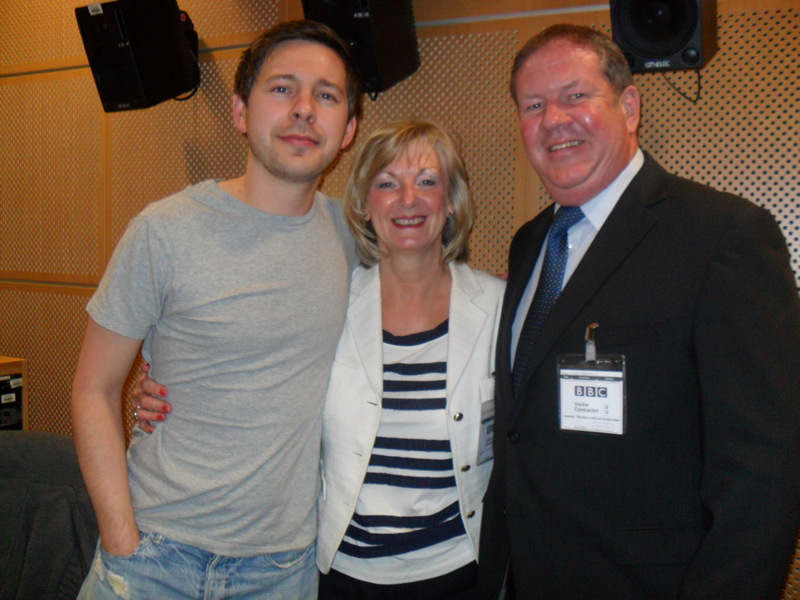 Off to BBC Radio Leeds for 10am tomorrow morning and will be live at 10.05. 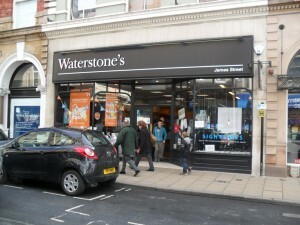 Then straight up to Waterstones, Albion Street, Leeds! 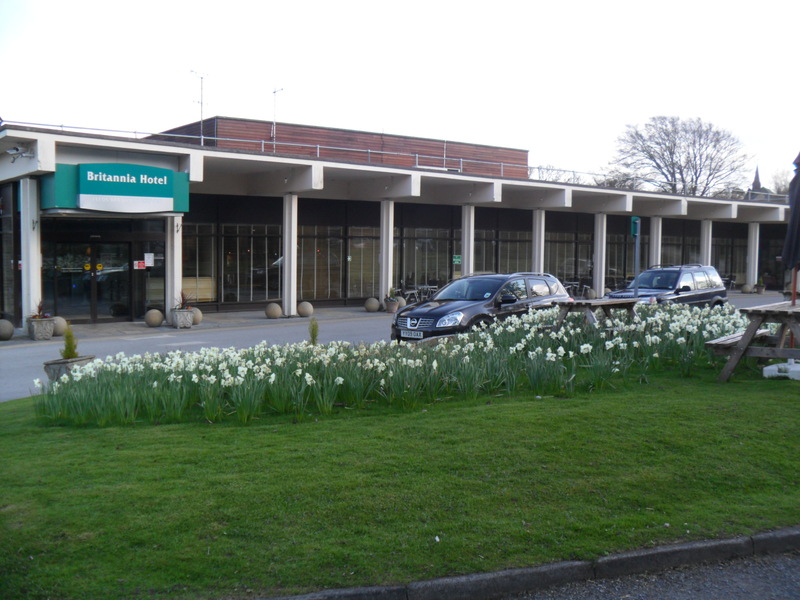 NORTH YORKSHIRE AND THE SPA TOWN OF HARROGATE. 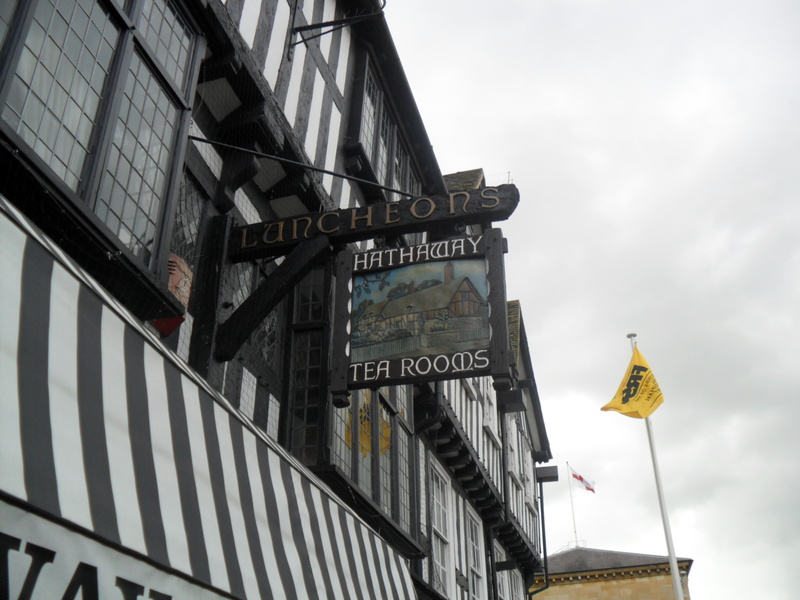 Today 14th April we are in this beautiful town although we couldn’t control the cold, windy and wet weather! We left the hotel and it was drizzling. Parked up in the multi story carpark as near as we could to the shop and guess what, the heavens opened! 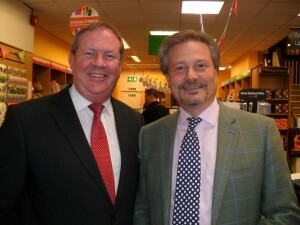 One brolly between us meant my hair had to be saved – sorry, it’s at times like this that it is good to be a manBob and you don’t have to worry about your hairstyle! Not too surprisingly it wasn’t busy in Harrogate but the sandwiches from the deli nearby were delicious and the staff were great! 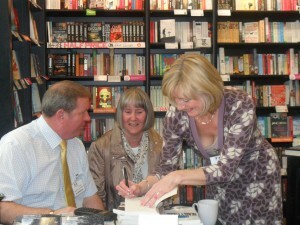 Carole Dove travelled from York just to see us and get her signed copy and Janet and Archie came from Barnsley! Then we got a great surprise as a former colleague from Calder Valley came into the store by coincidence and couldn’t quite believe his eyes! Nice to see you too Andy! Lovely meal in the hotel; Note to myself, must get a pic of the hotel for you tomorrow, if it stops raining that is! BGT on the menu for now and early night, ready for Leeds/Bradford International Airport tomorrow! Wonder who we’ll see there? 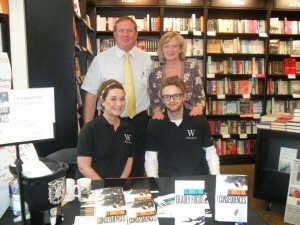 Waterstones Harrogate – when it stopped raining!